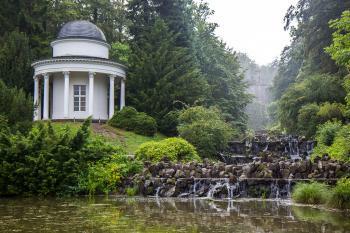 The Water features and Hercules within the Bergpark Wilhelmshöhe is a monumental Baroque and Romantic garden landscape. Water descends from the Giant statue of Hercules, passing a water-wheel-powered organ, various fountains, waterfalls, basins and grottoes. The dramatic water displays were laid out by Landgrave Carl of Hesse-Kassel from 1689 on, to display his power as an absolute ruler. He derived his ideas from Italian, French and English examples of garden art. The Italian architect Giovanni Francesco Guerniero was hired for the design. The site also includes the Neo-classical Wilhelmshöhe Palace (1785) and the Gothic Revival Löwenburg Castle (1793). 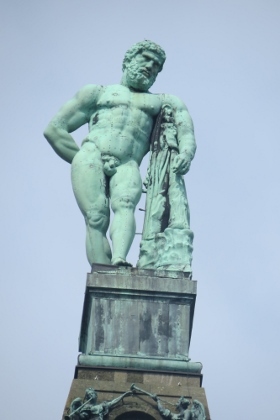 The statue of Hercules is 70.5m high and is made of copper. This brand new WHS is a likely candidate to make it into our “One million visitors or more” connection. After the designation as a WHS, the average visitor numbers rose from 3,000 to 8,000 on the days that the water works are displayed (Wednesday and Sunday). I had chosen Wednesday for my visit, hoping that this would be the most quiet of the two days. Kassel is located almost at the center of Germany, and within easy reach from the big cities in the Ruhrgebiet and Frankfurt. It also isn’t too far from the Dutch, Belgian and Polish borders. So these huge visitor numbers are no mystery. 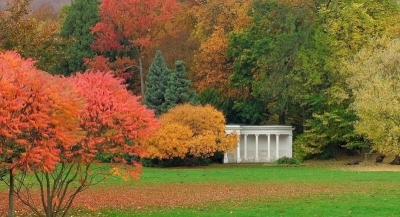 I had arrived the evening before, and stayed for the night in a hotel in Bad Wilhelmshöhe – the suburb the Bergpark is located in. This way I had an early start the next morning. My car was the 5th at the parking lot of Wilhelmshöhe Palace. There’s no entrance fee to the park, and it’s not fenced off either. Lots of trails meander in and out of it. Arriving before 9 a.m., I only met a few joggers and people walking their dogs. In about 2 hours I walked up from the lower car park to the statue of Hercules. It’s over 5 km, and there are couple of follies and other distractions to see on the way. The largest of these is the Löwenburg Castle, a mock medieval castle. Tours of the interior are given on the hour, but when I arrived at 10 they decided to cancel the tour because nobody showed up except for me. So I walked on upwards. It’s mostly a forest trail, and the hike should not be underestimated: it’s uphill all the time. There’s a public bus that stops at the main points for those that cannot walk that much. Later in the day I encountered lots of tired grannies and dogs that felt the heat. The toughest part is at the end, when you climb the steps next to the Grand Cascade. These stairs end at Hercules and the strange octagon & pyramid it stands on. I even tormented myself a little more, and paid 3 EUR to climb the interior of the octagon & pyramid too. Most of the time nowadays I skip these kind of “tower climbs”, and I would not say it was worth the effort here either. As the water works display doesn’t start until 14.30h, I had some time to spare. I had lunch at one of the restaurants, had a quick look at the uninspiring visitor center and walked half way down to the other side to see the Aqueduct and Neptune’s Grotto. The latter was covered in scaffoldings, just as part of the octagon & pyramid of Hercules by the way. I now encountered more and more people coming up, all in time to watch the water spectacle. By 13.30h I was back at the basin at the foot of the Grand Cascade, really tired from the distances I had covered on foot (and in the heat of the day). A few hundred people had gathered already, and I joined them in the grass for a siesta moment. The display started right on time, though it takes quite some time for the water to trickle down the Grand Cascade and become visible to all spectators. The funny thing about this site is that there is no running water at all when the water works are turned off. All you see is barren rocks that only get some meaning during the running hours. After the Grand Cascade, at 4 other spots in the park the water supply is sequentially turned on. All spectactors walk down, passing spot after spot. Despite the large numbers of visitors, it is easy enough to see the works in display and also walk the route without being crushed. It all ends at the Grand Fountain for the apotheosis: the “eruption” of the geyser-like and over 50m high fountain. I spent all day at the Bergpark, because of its size a visit takes a lot of time. And I even did not get into the Palace (which has a good art collection) or see all of the follies. A few weeks ago I visited a similar WHS, the Studley Royal Park: also a huge English landscape garden with water features. Comparing the two, I found Studley aesthetically more pleasing – both as a landscape and because of its “real life” folly Fountains Abbey. The Water features and Hercules within the Bergpark Wilhelmshöhe are weird constructions, over-the-top and a bit old fashioned for a tourist attraction. No wonder a comparison was made in the Nomination File with the displays of power and water richness in the Gulf (including Saudi’s 300m high King Fahd’s fountain, the modern day successor of Kassel’s Grand Fountain). The monumental statue of Hercules built on top of the tallest hill in Wilhelmshöhe Park dominates the surrounding city of Kassel. 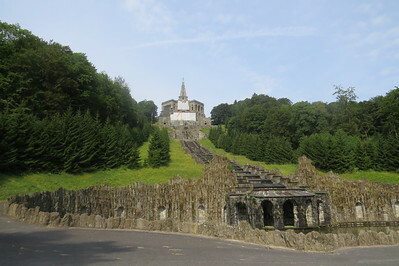 At the height of over 520 meters above the sea level, the statue can be seen from many viewpoints throughout Kassel and provides a natural culmination to the numerous natural and architectural features of the large hillside park below it. 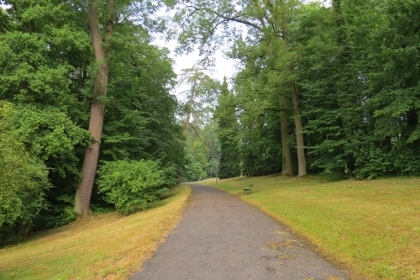 The local rulers, the Landgraves of Hesse, designed and constructed the park over the course of 150 years, with waterfalls, fountains and lakes added to the complex. As a result, a charming artificial water wonderland had developed in a capricious attempt to occasionally follow the strict rules of the English gardens, while striving to blend in with the pre-existing natural surroundings. According to the fashion of the time, just like Sanssouci Palace complex, Wilhelmshöhe is sprinkled with faux ruins, Roman aqueducts and pseudo-classic temples. The Landgraves of Hesse wanted not only to show off their wealth but also to create a space for respite, contemplation and appreciation of architecture. In fact, the Löwenburg castle in Wilhelmshöhe park, which imitates a knight’s medieval castle, was one of the first of such structures in Germany and started an important trend of romantic Gothic Revival. 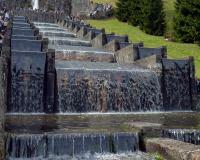 Still, the greatest engineering achievements in the park have to do with the massive hydraulic system of underground pipes, which connect the various water features throughout Wilhelmshöhe. 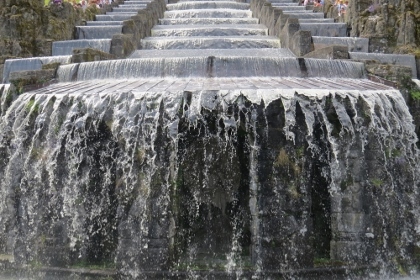 In order for the water to rush down the Cascades below the statue of Hercules, the water is connected from a spring source 3 kilometers away. Every Wednesday and Sunday the waterworks are on display as the water rushes down the Cascades and culminates with a 50-meter fountain at the bottom lake. Unfortunately, we just missed the display, having arrived on Thursday. Still, the park is a spectacle in itself and makes for a wonderful stroll full of glorious viewpoints and shady vistas. The entrance to the park is free, but you have to pay to visit the museums housed in the Palace. Kassel is in itself a small provincial town, which is well-connected by bus and train to major cities in Germany. The best way to see the park is by foot. It is possible to use a bicycle but there’s a lot of uphill which can be slightly unpleasant at times. Also, not all the tracks are suitable for bikes and you’ll be restricted to certain paths. It takes several hours to walk through and see it properly. There is no need to rush and no particular route that’s best to follow – the enjoyment comes from meandering along and exploring the different paths the forks in the road point you in. The Palace Wilhelmshöhe is easy to access because it is at the bottom of the gardens. The final climb along a series of water features to the Hercules statue is quite steep but easy enough if you take it slowly. The best forests are in this area and are a nice alternative way to get back down if you’ve walked up the main corridor in the centre of the park. I decided to travel first to Hercules, and from there descend along the winding path beside the cascade to the schloss.To reach Hercules I took tram #3 from Kassel city centre to its terminus at Druseltal, and there transferred to bus #22 whichn ascended to the visitor centre beside the monument. The base of the monument was shrouded in scaffolding, as was the upper terrace, which detracted from the view. From the schloss I descended to another visitor centre and the terminus of tram #1 for the return to the city. The cascades are closed due to maintenance during 2015. Check with sites own website before going there! I took a tram from the train station to the terminus in the park and walked for about 10 minutes to the palace. As I had only 3 hours in this city, I had to skip the exhibition at the palace and walked up to the Hercules statue via the Lowenburg Castle in the rain. I was disappointed that they were no longer doing the water show in October, but the autumn color was something to behold. Once I reached the statue, I would have loved to have lunch or at least a cup of coffee at the restaurant, but I had to catch another bus (in fact two buses) from the visitor center back to the train station. I have little to add to Els’s thorough review (and thorough “seeing” of the site – more so than ours!) but our experience of parking might be of use. We visited on a Sun 1 Sep 2013 i.e. a “Fountain day”. We arrived at around 12.30 and parked on the access road behind the Hercules. Things were well organized with stewards present to control traffic – the entire length of that access road (shown as K6 on Google maps) is given over to parking on one side with each car directed as far forward as possible and, at that time, we were perhaps 300 metres back (the actual car parks were already full). From what we could see when we departed later in the afternoon, cars arriving after us must eventually have reached all the way back more than a kilometer i.e “Busy” but not “impossible”. But you would want to arrive some time before the start anyway. I visited this WHS 10 days before it was inscribed in the list in June 2013. Everybody knew already that it would be inscribed as a WHS and there were posters everywhere showing that it would be inscribed on the list shortly. The park and gardens are very well kept and there are streams, waterfalls, ponds, fountains and beautiful landscapes ... all rigorously artificial and man-made! I really enjoyed the steep walk to the Hercules statue which has recently undergone restoration and cleaning. 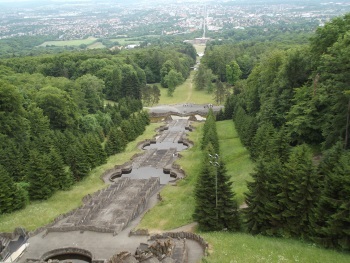 The view of Kassel from the Hercules statue is well worth the climb. I visited by car and there is a very convenient Schlosshotel car park near the entrance to the park open to non-guests too. Interesting and enjoyable day trip especially on a sunny day.